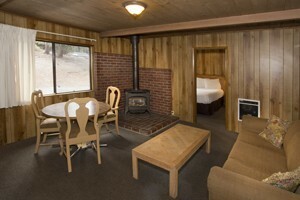 500 square ft, offering 1 or 2-bedroom cabins with new King beds, living room & convenience kitchen. Flat screen tv, dvd player, ipod dock & ski/snowboard rack. A Mammoth vacation couldn't be better than at a scenic location beside Lake Mary. Stay in a rustic cabin with fireplaces and firewood, full kitchens. Friendly, historic, fun and rustic cabins on the June Lake Loop. Year round ~your best value and hospitality. The Gem of the June!